It isn’t easy being a metal-head, especially if your taste in music is a little more brutal and extreme than that of those of your average, every day run of the mill riff disciples. To really understand the plight and joyous sorrow of what it means to be a slave to the blast beast, you have to be one of dark hearted devotees of the harder metal sub-genres. It’s a semi-exclusive club in which Belzebubs artist, writer, creator and stygian overlord JP Ahonen has a seat on the board of directors. 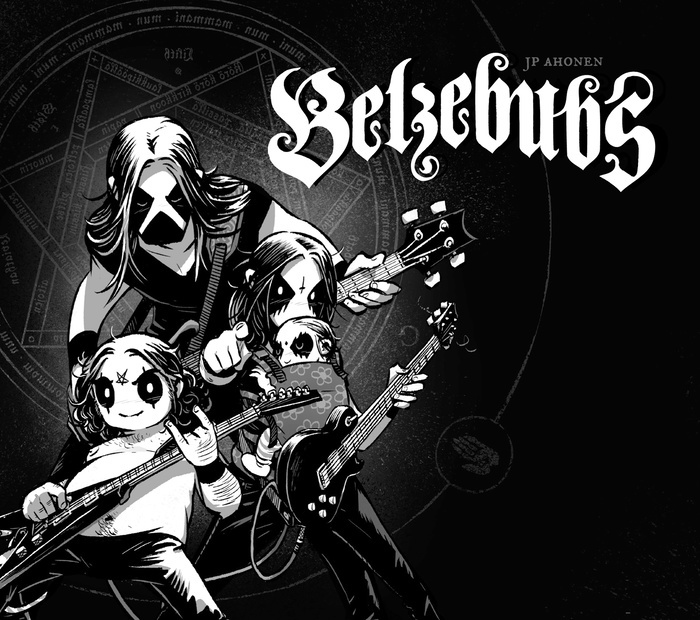 Heck, I wouldn’t be surprised if he was, secretly, the Chairman as his innate understanding of what it means to be a rabid fan of outsider culture is writ large in every page and panel of Belzebubs. Imagine the Addams Family taken to the nth degree and you’ll have a pretty good idea of the world that Ahonen’s wonderfully strange, bizarre and endearing characters inhabit. It’s the story of family who live every single Black Metal stereotype and cliché to the absolute fullest. The father plays in a struggling band who can never hold on to a drummer, the mother attempts to hold the family together while ensuring that they all maintain their fervid belief in the blackest demons and devils, the daughter struggles with her first crush on a “normal” while the youngest member of the clan enter a rebellious phase that involves a brief flirtation with the favourite son of Heaven.